Today God pursues to plead, not to punish. In Him you find wrath averted, offenses forgiven, sins forgotten, shelter provided, and Love personified. "God is Love" may sound trite, but it is true. He doesn't admire all you do, but He does love you. This fact carries power of prodigious proportions, as we shall see (1 John 4:8). God stands willing and able to fashion you into the likeness of the Man Christ Jesus Who loves you. This is an offer with no strings attached. This is an offer with no prior commitments exacted. This is an offer with no cancellations mortgaging the future. This is an offer with no penalties for failures incurred while trying. Growth in grace is a slow process, and often a painful one. Creative conflict is part and parcel of this conformation to Christ Jesus our Lord (Romans 8:28, 29). Thus the future is secure. Oh, to be sure, it will be different. You can count on that, for this future will be a partnership with your Lord. You need never again feel estranged. You need never again feel alienated. You need never again walk alone in this world. God, Who is the un-lying God, the un-false One, guarantees it. He is never false, even though you should prove faithless. He never lets you down, even though you renounce him (2 Timothy 2:13; Titus 1:2). God promises to finish what He began in you, for He has the wisdom to plan and He has the power to perform. God's limitless resources are devoted to saving and using your personality with its dispositions, not splitting it. The only way Christ could publicly portray God's love for you was to be delivered for your offenses and raised for your justification. Now these may be merely words to you, yet they are much more than just semantics and symbols. They are truth with a dynamic. To those enslaved to all from which they long to be emancipated, God's declaration delivers. This is God's emancipation proclamation to all who are slaves of self and sin and society (Romans 4:25). God speaks to the world in the language of facts. What has He done that makes His declaration good news to you? God's love is good news, God's grace is good news, and His grace and love are His power for salvation to all those who go on believing. The evangel is God's power for salvation (Romans 1:16, 17). You see, you are two Adams: one actual and the other potential. In the first Adam you are a slave to sin: this is actual and a fact that is true altogether apart from your disbelieving. In the last Adam you are free to become righteous: this is potential and a fact that becomes true when you believe (Romans 5:12-21). In the first Adam you are constituted a sinner and stand condemned: this is actual and is true altogether apart from your disbelieving. In the last Adam you are uncondemned: this is potential and becomes true when you believe (1 Corinthians 15:45). In the first Adam you are dead; in the last Adam you are alive. In the first Adam you are decreated; in the last Adam you are recreated. In the first Adam you are a sinner; in the last Adam you are a saint. In the first Adam you are estranged; in the last Adam you are reconciled. In the first Adam you are an enemy; in the last Adam you are a friend. In the first Adam you are weak; in the last Adam you are strong. In the first Adam you are far off; in the last Adam you are made near (Ephesians 1:7; 4:17-19). Does all this sound like double-talk to you? Does it sound like a paradox? Does this offend you, does this scandalize you, does this provoke you, does this seem to insult your intelligence and make wisdom stupidity? Does this seem to present power as weakness? Does this demolish your world of values and rearrange your list of priorities? If it does, this is understandable, but the fact remains that God has done something for you that can mean your freedom from sin, that can mean your load of sin is banished, that can set forces in motion which are capable of making you over entirely -- emotionally, mentally, psychologically, and spiritually. This cure is so radical that there is no New Testament Greek word which now can be properly translated "guilt." Guilt is gone by the grace of God. Paul does not say that you cannot understand the things of God. But Paul does say that man does not approve of what he hears since it is foolishness and a stumbling block to him (1 Corinthians 1:18-25). Man loves darkness rather than light. Man rejects truth rather than lies. Man does not want to be wrong so he protects himself by refusing what is false. But there is another way to be wrong -- by rejecting what is true (John 3:17-21). Man does not want to see and hear and know because he can be held accountable for acting in accord with what he sees and hears and knows. In this manner man attempts to make a bulwark of his ignorance and a virtue out of his refusal to know. Yet candor compels him to confess that he can be held responsible for refusing to see, for refusing to hear, for refusing to respond to God's overtures of peace (2 Corinthians 10:4-5). All we are asked to do, is to herald God's good news -- to announce it as the Fact that it is. To this Fact you have an account-ability and a response-ability. No appeal to hereditary defects avails, no pleas that you are crippled by being deprived of a cultural milieu in which you would otherwise be good avails. No, it is man who is at fault, not heredity and environment, though these do play their parts. But they are not man's scapegoats, and this to man is a tragedy. Isn't it a fact on which to ponder that the word "tragedy" is to be traced to the Greek tragos, which means goat? Man feels that he is made to be the goat in a tragedy not of his own making -- everything else and everyone else is at fault, but not the man whose image is reflected in his mirror. But bad news about you is not good news about God. 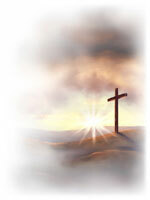 Let us look at God's message: Christ died for all, consequently all died. And He died for all and was raised for the very same all so that He could use this Fact, as a lever to move you into wanting to live for the sake of the One Who could love you this much (2 Corinthians 5:14). God's love is the lever which motivates you to change the aim of your life from serving yourself to serving your Savior. His love is the lever which will change your center from ec-centric to Christo-centric, from out-of-center to right-on-center. His love is a lever to completely change your pattern of behavior because the former authoritarian pressure from the outside is being displaced by the new expulsive power from the inside. His love is a lever to change the quality of your disposition from soulish to spiritual, from law to love, from flesh to spirit, from I-got-to to I-want-to. If you have now believed God, do you feel different? If your answer is "No", the fact still remains that He has accepted you. If you have now believed God, do you feel afraid to face the future lest you fail again? If your answer is "Yes", the fact still remains that He empowers you. It is not your No and Yes that counts; but rather it is God's Yes, for all His promises have received their Divine Yes in Christ. His great and precious promises are for the purpose of making you a partaker of His Divine nature (2 Corinthians 1:20; 2 Peter 1:4). You begin by believing God. You continue your faith by believing God, and you will get new life for yourself out of your faith in His faithfulness. Faithful is He Who is calling you, Who will be doing it also (1 Thessalonians 5:24). He accepts you as you are -- weak, irreverent, a rebel, a sinner, and an enemy (Romans 5:6-10). Accept Him for what He is -- your re-Creator, your Peace, your Forgiver, you Deliverer, your Enabler, your Wisdom, your Righteousness, your All. God is all these actually. He stands ready to be all these to you potentially. Unbelief alone keeps you from experiencing all these blessings. Believing Him makes them to be yours actually. God will take you at your word when you take Him at His word. Accept the fact that you are acceptable to God and will be accepted by God. God loves you. What more can He say to you than what He has already said? 15570 Knochaven Road, Santa Clarita, CA 91350, U.S.A.